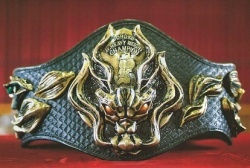 Championship apart of Michinoku Pro Wrestling that was brought to Mexico by Atlantis. After a few defenses, Atlantis lost it in Japan where the championship now remains back in Michinoku Pro Wrestling. decision match for vacant title. This page was last edited on 8 December 2017, at 06:27.